One of the partners behind a successful business centre in West Hull is to embark on a similar project in East Hull after agreeing a lease on a vacant office building. Les Bennett has ended his involvement with West1 in West Dock Street, Hull, to concentrate on the new centre which will open in August in Emily Street, in the heart of the city’s burgeoning renewables sector. We’re less than half a mile from the new Siemens factory so we hope to capitalise on their supply chain, and there is a lot of other new development going on in the area, starting with a new Lidl supermarket right next door to us. Les worked in sales and marketing for a series of blue chip companies before going into partnership to operate West1 in 2013. The success of that venture and similar sites in the Hull area persuaded him to pursue a new project with his partner and their daughter. He became aware of the Emily Street site through his relationship with Garness Jones, who acted for original owners InterBulk as they agreed a sale and lease back arrangement in 2014 prior to relocating to their new premises at The Beacon in Hull. We’re very familiar with this particular property having handled the sale by InterBulk in 2013 which gave them the flexibility and resources to prepare for a move. When The Beacon presented InterBulk with the ideal location to grow their business in 2015, Les was already looking at this site. We worked closely with Les and his partners on the development of West1 and it is clear that he has the knowledge and expertise to repeat that success. The new business centre will have modern facilities and is in an excellent location. 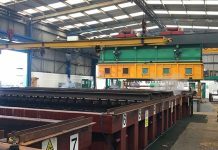 It will be refurbished to a high standard and is aimed at a market sector which is seeing increasing demand. Phase one of the refurbishment programme will bring improvements to almost 5,000 square feet on two floors. A second two-storey building will provide more than 8,000 square feet of office space. The site has parking for more than 40 cars. The priority is to get the first building refurbished to a modern standard and get some businesses in there. We aim to be ready for occupancy by August 1 and once it’s up and running we’ll look at the second building. The costs will include all utilities and a staffed reception and the space and terms will be flexible, with offices from 125 square feet up to 1,000 square feet and easy-in, easy-out agreements. West1 is at 100 per cent occupancy and is a great example of the demand for this sort of business centre. This fits with my ambitions to create a family project so that is what we are going to do, provide somewhere which can be a stepping stone for incubator businesses and a permanent home for people who want to build their business.